JohnS writes: I have absolutely no use for the new Newsstand thing in iOS 5, and I want to dump it into a folder of apps I never use. But my iPad won’t let me! Newsstand comes in handy if you love reading the New York Times or Vanity Fair on your iDevice, and it alerts you when new issues arrive and even downloads them in the background, which I love. But if you prefer reading the news on good, old-fashioned paper and you’d rather not have Newsstand junking up your iPhone or iPad home screen, your options are a bit limited. Unfortunately, since Newsstand is now “native” to the iOS software (as are the Apple-designed Weather, Stock, and Calculator apps), you can’t just delete it off your phone. Why? 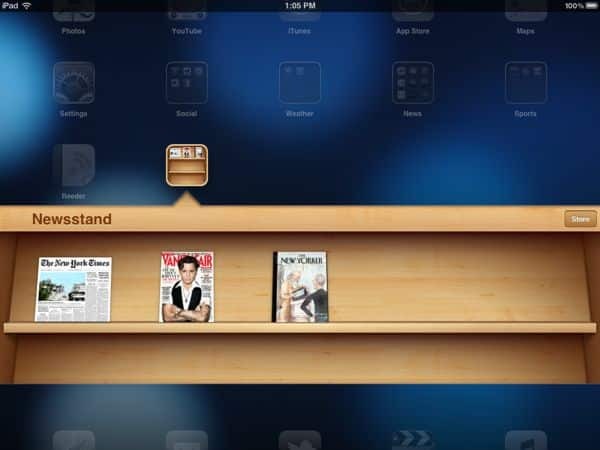 Because as far as the iPhone and iPad are concerned, Newsstand isn’t really an app at all. Instead, it’s just another folder—one designed specifically to contain your digital newspapers and magazines. And in the world of iOS, you can’t put a folder in a folder. Annoying, yes, or at least it is if you’re not a Newsstand fan. If you’re really intent on hiding the new iOS 5 Newsstand, you could try banishing it to a far-off home screen. Just tap and hold the Newsstand folder until it shakes, drag it to the right edge of the display until it slides to the next home screen, keep going until you’ve create a new screen at the very end, then click the Home button. Update: A few helpful readers have posted tips below for hiding Newsstand in a folder; keep in mind, though, that the tips aren’t sanctioned by Apple, and they may cause Newsstand to crash. Get the scoop on iOS 5 and iCloud, Apple’s online sharing service, right here.